Glam Morena: Pantene Truly Natural. Finding the perfect hair care products or creating a hair routine has always been a huge struggle of mine. I have gone through so many hair care lines and I have tried so many brands. I used to use Pantene in the past, but I have not used it since they updated their hair care products. 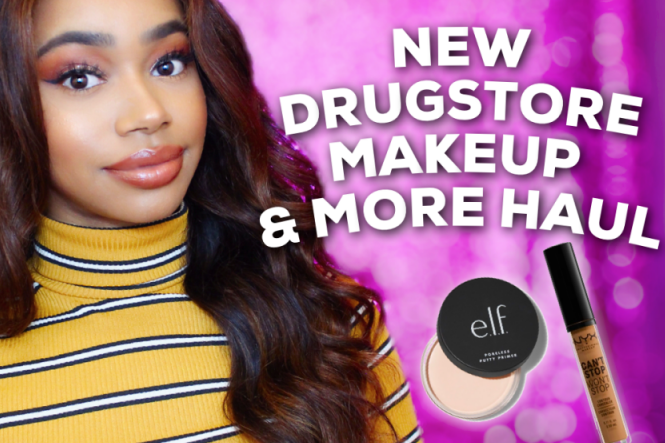 It's a really affordable brand that you can find in most stores, such as Target, Walmart, and other drugstores. Pantene offers a Truly Relaxed line for relaxed hair and a Truly Natural line for natural hair. Be sure to visit the Pantene page to learn more information about each product available. 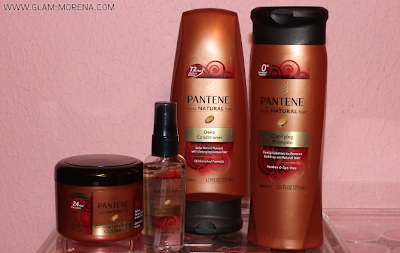 The items that I'll be talking about today are from the Pantene Truly Natural Line. This particular line includes five products. I only have four of those five products though. Pantene Natural Hair Clarifying Shampoo: Designed to gently cleanse your hair’s unique structure and remove buildup—leaving it shiny, clean, and refreshed. 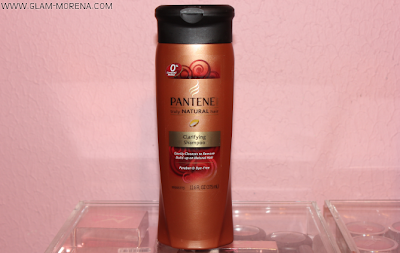 My Thoughts: I normally wash my hair with the Pantene Natural Hair Clarifying Shampoo once a week. I apply it twice to my hair before applying conditioner. It's perfect for me because by the end of the week I sometimes have a lot of buildup. I do find that it removes product buildup in my hair. It also leaves my hair really soft. I didn't notice any shine immediately after use. This may be due to the fact that my hair was still damp though. Pantene Natural Hair Deep Conditioner: An oil-enriched conditioner that moisturizes and detangles natural hair. This conditioner can provide up to 72 hours of moisture, leaving hair so healthy it shines. My Thoughts: Deep conditioning my hair is a very important step of my hair care routine. My hair texture is very thick and can sometimes get a bit dry. I use a deep conditioner to add moisture to my hair. After washing my hair with the Pantene Natural Clarifying Shampoo I apply the Pantene Natural Deep Conditioner from tips to my roots. I make sure to focus the conditioner on the ends of my hair since it tends to be a bit drier there. I leave it on for about 10 to 15 minutes. My hair was noticeably softer and felt really moisturized. I was also happy that the conditioner didn't cause my hair to tangle. Pantene Natural Hair Defining Curls Custard: Works with your hair’s unique structure to define curls and control frizz up to 24 hours, even in humid weather. 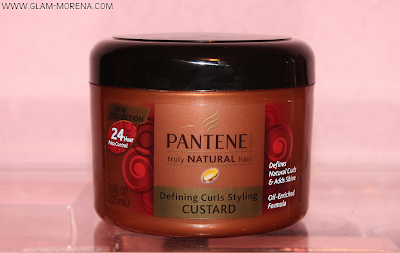 This styling custard leaves curls manageable and feeling soft. My Thoughts: This was my first time using a curls custard. I tend to use the Pantene Defining Curls Custard right before diffusing my hair and then I apply a little bit more once I'm finished diffusing my hair. This product really helps to enhance and hold my natural curls. I noticed using this along with the Pantene Natural Hair Shine Serum that my hair is frizz free. This is a big plus for me since I do live in a more humid climate. 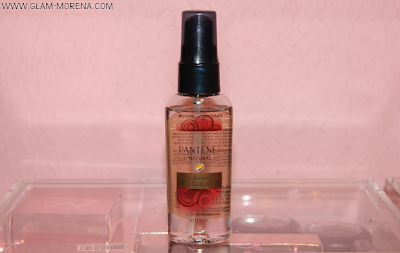 Pantene Natural Hair Shine Serum: A daily serum that provides intense moisture and a long-lasting brilliant shine. It leaves your hair soft, smooth, and protected and ready for any natural ’do! 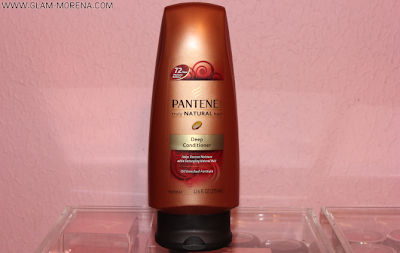 My Thoughts: I use the Pantene Natural Hair Shine Serum right after I've rinsed my conditioner out. I apply it on damp hair making sure to focus most of the product on the ends of my hair. That way it can act as a heat protectant while I diffused my hair with a blow dryer. Then I apply a quarter size amount to my hair again to help lock in the frizz. I also love that this product includes Argan Oil! It leaves my hair shiny and soft without any noticeable frizz. For the price I think the Pantene Truly Natural Line gets the job done. Each product works great to help add moisture and shine to your hair. My hair was definitely a lot softer and smoother after using each product. I am also pleased that this hair care line has a really nice scent to it too. If you're looking for an affordable hair line for your natural hair then I suggest giving this line a try! 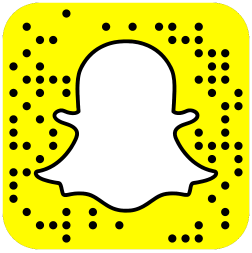 Check out the Pantene Facebook page and the Pantene Youtube channel. Have you tried the Pantene Truly Natural or Truly Relaxed Line? Share your thoughts.